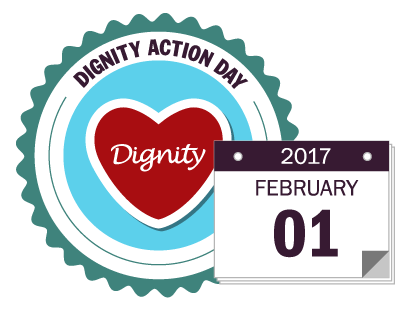 Dignity Action Day on 1st February 2017 started a month of activities and events to promote dignity in everyday life. This is an annual initiative by the National Dignity Council whose motto is ‘Dignity in hearts, minds and action’. The National Dignity Council is a registered charity whose primary aim is to promote dignity across the board and raise its profile. The Council works actively to promote dignity in work settings and to challenge poor practice wherever they see it, by using the support of over 81,000 registered champions. ‘Dignity in Care Campaign’ and the ‘Dignity Challenge’ were launched in 2006 by the then government to primarily promote dignity and respect for older people. The ‘Dignity Challenge’ has subsequently been amended to ‘Dignity Dos’ and promoted by the National Dignity Council. A Dignity Champion is someone who believes passionately that being treated with dignity is a basic human right, not an optional extra. They believe that all care must be compassionate, person centred, as well as efficient, and are willing to do something to achieve this. A role descriptor for the champion is available on the National Dignity Council’s website. Every year the National Dignity Council celebrates Dignity Action Day on the 1st February which marks the start of a month of activities that provide a showcase for good practice, involving others and raising funds for the campaign. The Council invites everyone to join in the celebrations by holding ‘Digni-Tea’ events to promote dignity in your circles. It can be as simple as having a cup of tea with someone who is lonely, or holding an afternoon/morning tea session to celebrate and showcase your work. A cup of tea is a great vehicle to discuss how you can improve the experiences of individuals, whether you are in a care home, a hospital or a bank – the idea is to make someone feel special. There are many events held up and down the country to raise awareness of dignity and how to promote it in your daily life. For inspiration visit the Council’s website. So why not join in the celebrations, become a dignity champion, hold a tea party, have a pampering session for your care home residents and pledge to improve the lives of people who find themselves in vulnerable situations. Dr Rekha Elaswarapu is an experienced independent consultant who is passionate about quality improvement and better outcomes for people using services in health and social care particularly older people. Rekha is currently a trustee of Age UK Ealing and is one of the longest serving members which includes being a Vice Chair. With nearly twenty years of experience in health and social care environment both in policy and regulation as well as research, Rekha brings a unique combination of knowledge of statutory, voluntary and academic sector to provide joined up solutions for quality improvement.